You are currently browsing the tag archive for the ‘Nation of Sanctuary’ tag. The summer of 2015 has seen a massing of support for refugees in Europe. If even the typically hostile Daily Mail urges us to think of the lives lost in the Mediterranean, inflammatory and completely dehumanising remarks like those of Katie Hopkins, just seem like a distant memory – and the fear towards ‘the other’ that the media had for so long attempted to smear us all with, appears to finally be well and truly changing. In this context, and the thousands of people who are joining social media campaigns, setting up groups and organisations, raising thousands of pounds in donations, and making trips to Calais, as well as now also contacting existing organisations to ask to find out more and offer help, and helping to bring existing campaigns (like those of City of Sanctuary, Oxfam and Citizens UK) closer together in a wider spirit of solidarity, we could be heading towards a shift from the ‘little islander’ narrative that parties like UKIP have played on, and create a new narrative of international solidarity and a shared destiny for us as 21st century global citizens. However the next months transpire in terms of the media coverage and levels of support, people will still want to seek sanctuary in Europe from military warfare and the more oppressive regimes, so we must not forget the thousands of people who are still yet to make Britain their home, at least for some time, and show people some of the same welcome that has been so inspiring to see transcribed on banners across football stadiums in cities in Germany, and at the railway stations as people arrive – including now in Budapest, as donated shoes are left for the next to arrive there. 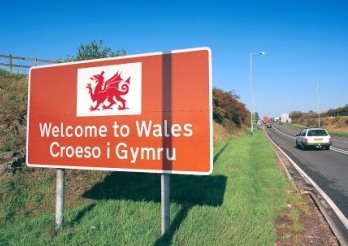 Cardiff became the city it is today because of immigration. The docks in Cardiff were built by the sweat of the brow of Irish migrant labour in the nineteenth century. They brought people from around the world to settle here and build a life for themselves. We need a 21st century culture of hospitality and welcome across Wales, especially for refugees who are seeking sanctuary from war and persecution. At midday today, Wales will hold at least three demonstrations to support refugees and migrants, and highlight the need for greater support for Syrians and other asylum seekers already in the UK. The Cardiff demonstration is called ‘Wales says #RefugeesWelcome’ – marking the hashtag that trended as opinions about this summer’s refugee crisis changed. It will assemble at the statue of Aneurin Bevan, as we remember that the NHS wouldn’t be the same without the hard work and dedication of migrant labour in Britain. It will end with a march to the Home Office on Newport Road. This protest has been initiated by campaigners from Cardiff People’s Assembly, Cardiff Stop the War Coalition. HOPE not hate South Wales, No Borders South Wales, Rumney Forum, UNITE Cardiff Community Branch and others. It is supported by Welsh Refugee Council and Trinity Centre Cardiff. It is part of a European day of action. The activists of Europe can work together, even as the governments of the nation states argue over who is to blame and what principles of the EU might remain after this summer. It is in fact working class solidarity that is needed more than ever, and is a part of the migrant struggle. If the working class is divided, the elite find it easier to exploit us – it is only through solidarity that we can build on what we have in common, then focusing together on the need to challenge those elite powers, that, at the moment, can decide all our lives and our futures – and work together to not be dominated by them. The refugees’ struggle is our struggle, and we’ve got a world to win.